The fight against dumping, which has stymied the growth potential of the local chicken industry over the past several years, has won a small but significant victory with the imposition of a new safeguard duty on frozen, bone-in chicken portions from the EU. In terms of the economic partnership agreement safeguard, published recently in the Government Gazette, a 35.3% duty is effective on frozen chicken portions from September 28 2018 up to March 11 2019. This temporary measure will remain in place for three years after that, although it will be lowered to 30% for the first year, 25% in the second year, and finally to 15% until it expires on March 11 2022. The FairPlay movement, which fights for a level playing field in trade and for the preservation of South African jobs, is heartened by the news. 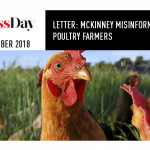 The material damage suffered by the South African chicken industry due to unrestricted dumping by the EU over the past five or so years is indisputable, and is the very reason we founded FairPlay. It is very rewarding to see the government respond to the pressure, because thousands of jobs have been lost, unemployment has increased, and imported chicken has cornered 30% of the market, claiming a bigger market share than any of the South African producers. This is simply not the position you want for a strategic domestic industry, especially one that impacts the nation’s food security. The safeguard, despite being temporary, buys the industry much needed time, and gives it breathing space to make contingency plans for the future. 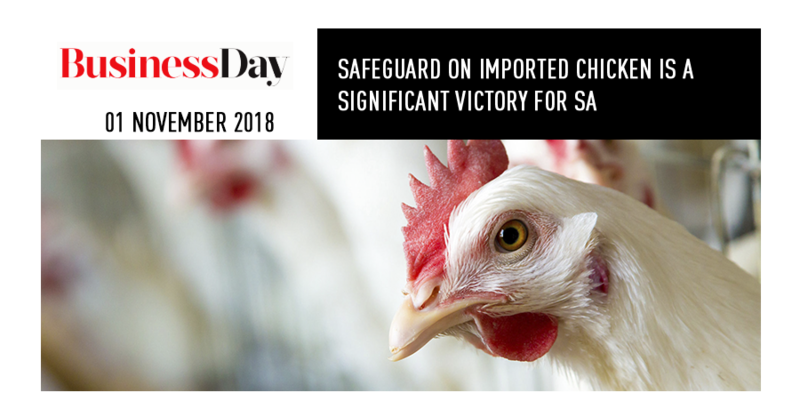 The South African Poultry Association (Sapa) has also expressed relief at the move. 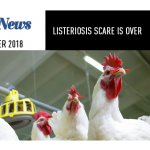 Marthinus Stander, chair of Sapa’s broiler division, has confirmed that the duty is expected to help the industry, at least for the first two years at the higher rate. He argues that since EU producers are less efficient than SA’s and much less efficient than Brazil’s (as proved by independent research conducted by Wageningen University in the Netherlands), the EU will battle to absorb the duty and just lower the price. This is expected to slow down imports from Europe. However, as Stander duly points out, Brazil very easily stepped into the gap left when EU imports were temporarily banned last year due to avian flu, and dumping from Brazil is expected to continue at the current, crippling rate even if the EU slows down. Imports of frozen, bone-in chicken rose from 145,000 tonnes in 2013 to 240,000 tonnes in 2016. By the end of 2017, volumes remained high at 233,000 tonnes, even though there was almost no contribution from the EU at that time due to the bird-flu ban. Worryingly, Statistics SA reports show that 2018 is heading to be an all-time record year for imports, which hit a new high in the first six months of the year, led by Brazil. The fact is that the industry needs solutions that will offer long-term protection. SA’s chicken farmers currently produce 19-million chickens a week. Consumption is estimated at 25-million a week, and, according to Stander, local producers are completely capable of making up that difference if the industry, with government protection against dumping, is allowed to expand. With the president’s stimulus plan at the forefront, it has been suggested that the time has come for the government, industry and labour to band together to create a masterplan, with traceability at its core, for the development and expansion of this strategic agricultural industry. The masterplan will bring all the stakeholders together to negotiate and design a plan, in terms of which the participants will make commitments that will provide some certainty and stability for the industry so there can be growth and investment. The car-manufacturing and cotton industries are great examples of how such a plan can succeed and make a difference. Expansion of the industry would create thousands of extra jobs, and that is a matter close to FairPlay’s heart. An expanded industry means employment for thousands more workers, not only in the chicken industry but all along the value chain of the related sectors, starting with the feed industry. There has never been a better time for intervention. The task-team appointed by government in 2016 to find solutions to the industry crisis has been slow to show results, but we believe it is now looking at the matter with renewed vigour. The implementation of the safeguard tariff also shows that the government has recognised the chicken industry as a strategic industry worthy of protection. Curbing dumping is essential, but so is the enforcement of labeling standards for imports that conform to local requirements, ensuring the same level of traceability for imported chicken as is the norm for locally produced chicken. These are essential conversations needed in the creation of an industry masterplan. Despite the relief brought by the safeguard tariff, the industry is still vulnerable to setbacks such as drought, which drives up feed costs. And with recent reports warning of a 70% likelihood of El Niño weather patterns hitting Southern Africa later this year, the worry is real. El Niño often brings drought, and a poor maize and soybean crop would be very bad news for the chicken industry at this point. Feed costs comprise nearly 70% of the industry’s input costs, and as SA saw in 2016, a drought-related hike in soy and maize prices cripples chicken farmers, especially the smaller, emerging farmers who work on the tightest of margins. Years of unchecked dumping has forced the industry to operate on anorexic levels, not allowing any fat to store for the lean years. An industry as important to national food security and economic growth cannot be left to fend for itself on a hand-to-mouth basis. This is why it is so important that the time bought by the new safeguard is used by the government, the industry, and all stakeholders to plan a future strategy for the industry to survive and prosper. • Baird is founder of the FairPlay movement.